The last two weeks have seen a violent wave of Palestinian terror in Israel. Nearly every day terrorist acts are committed against Israeli citizens in cities and towns throughout the country. This Wednesday alone saw four such attacks in one day. On Thursday evening, Prime Minister Netanyahu addressed Israeli citizens stating that as was the case in the past, this wave too shall come to its bitter end. According to the Israeli MFA, Palestinian incitement is the cause of the current wave of violence against Israel. This incitment is both secular and religious. The secular incitement originates from the Palestinian leadership in the West Bank which refuses to condemn terror attacks against Israelis. The religious incitement originates from groups like Hamas who target Israelis because they are Jews. In a statement published earlier today, Israel’s PM continued this line of defence as can be seen in the tweet below. The joining of the PA (Palestinian Authoruty based in the West Bank) and Hamas in this tweet is deliberate and is also part of the Israeli narrative. It serves to demonstrate that when it comes to inciting hate and violence against Israelis, there is no difference between the Palestinian government and religious zealots. Additionally, the Israeli MFA has published tweets that include Palestinian films which actually teach viewers how to attack Israelis. Part of Israel’s narrative offers a causal interpretation to the current wave of terror. The cause according to Israel lies solely with Palestinian President Mahmoud Abbas. In a long series of tweets, the Israeli MFA states that the President refuses to denounce terror, that he incites terrorism by naming streets after Palestinian terrorists and that he is the cause of the current wave of terror given his combative speech at the recent UN General Assembly. PM Netanyahu: Abbas calls public squares in the honor of mass murderers – It's a tragedy, for us and the Palestinians too. Interestingly, while Israel alleges that both Hamas and the PA incite against Israel, it is Abbas alone who is identified as the root of the problem. This may be seen as an attempt to pressure Abbas into using his power to bring this wave of violence to an end. It may also be an attempt to rally international condemnation of Abbas which in turn validates Israel’s claim that he is no partner for peace. In both cases, however, Israeli digital diplomacy channels seem poised at delegitimizing the Palestinian President. Morality may be seen as central to diplomacy. Nations whose power is seen as legitimate are freer to exercise power. Likewise, nations who seem to embody certain values more freely promote their foreign agenda. Thus, it is not surprising that on social media Israel seeks to morally condemn the Palestinian side while seeking the higher moral ground for itself. With regard to Palestinian morality, or lack therefore, several Israeli tweets highlight the deep tooted Palestinian hatred of Israelis as well as the immorality of their crimes. 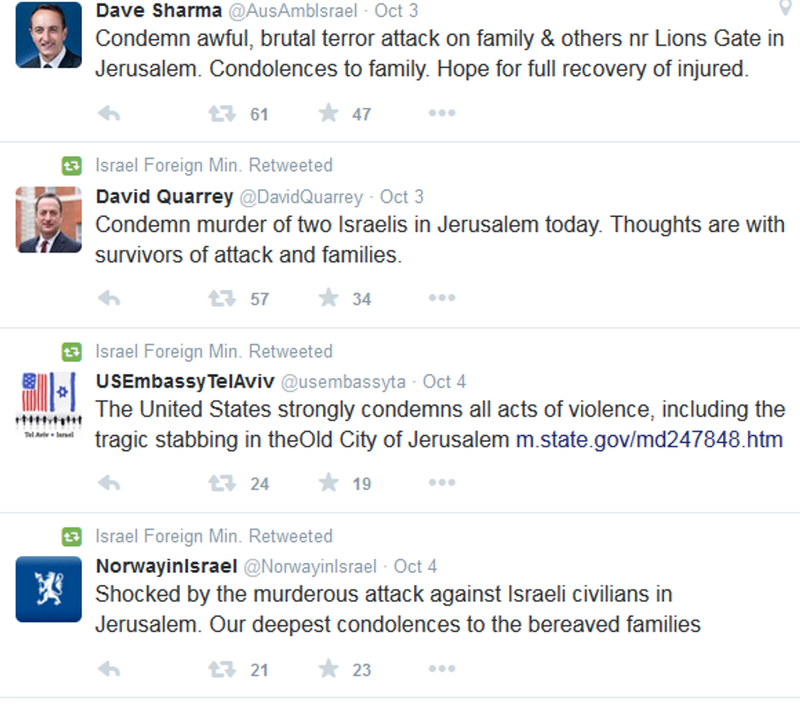 The Israeli MFA has also used statements from other nations in order to condemn Palestinian attacks. This may be an attempt to demonstrate the world’s collaborative moral condemnation of Palestinian terror. Such tweets, as can be seen below, are also used to exhibit international support of Israel. Finally, the Israeli MFA has also published content that depicts its own morality. The tweet below, for instance, details the amount of humanitarian aid delivered daily into the Gaza strip by Israel while these terror attacks continue to escalate. The final element in the Israeli narrative deals with proposing a solution to the current attacks perpetrated against Israelis. This solution is rather straight forward- the Palestinian leadership, which incites against Israel and who refuses to condemn terror attacks against Israelis, must denounce these acts and use its police authorities to put an end to the current cycle of violence. While Israel has used social media to promote its own narrative, it has also operated outside cyberspace in order to demand that social media companies remove content that promotes violence against Israelis. According to an article in the Haaretz newspaper, Israel’s MFA sent a letter to Google and Facebook demanding the removal of such content. This mutuality between the MFA’s online and offline activity demonstrates that digital diplomacy never exists in a vacuum. While the Israeli MFA has used social media to offer a coherent narrative of recent events, one has to ponder the efficacy of this narrative. First, Israel’s arguments do not contend with the Palestinian narrative also being disseminated online. According to that narrative, it is not Palestinian incitement but Israel’s attempt to alter the status quo on the Temple Mount that has unleashed the current cycle of terror. Moreover, Israel’s refusal to negotiate with Abbas has brought on a sense of despair and frustration amongst young Palestinians who now turn to terror. While these claims may be debated, Israel seems to ignore them all together. By so doing, Israel may be unable to influence the opinions of global audiences or journalists which are exposed to the Palastinian narrative. Secondly, both Israel and the Palestinians are attempting to portray the reality that currently exists on the streets of Jerusalem and Ramallah. Yet by ignoring the Palestinian narrative, Israel presents social media followers with a reality so at odds with that being promoted by the Palestinians that they are left dazed and confused. So while the choir may be convinced by Israel’s online preaching, the larger congregation is baffled. Finally, one has to wonder if Israel is not tarnishing the image of Mahmud Abbas to the point of no return. After all, Israelis also monitor their MFA online. By assigning blame to Abbas, and depicting his immorality, the MFA may prevent the Israeli government from being able to negotiate with the Palestinian President once the terror ends, the dust settles and today’s tweets pass into memory. Posted in Uncategorized and tagged Digital Diplomacy, Facebook, foreign ministry, Google, Israel, Palastine, Social media, terror, Twitter. Bookmark the permalink.